“We must travel before our kid arrives!” We hear this often enough from soon-to-be parents who understand the responsibility and commitment it takes to establish a family. Kids are one of the greatest joys a parent can have, but with them around, it’s unlikely for us to simply buy an air ticket and travel on a whim without proper travel insurance. Having children does not mark the end of travel though, and you can continue to fulfil your wanderlust. You simply need to plan well when travelling with kids. 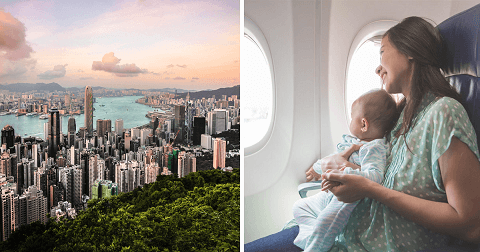 With safety, convenience, and the fun factor in mind, read on for useful travel tips and a list of family-friendly destinations that are just a few hours away from Singapore – easily accessible by land, air, and sea! Located less than 2-hour drive from Singapore, Kukup is that all-inclusive destination for seafood, alternative living and fun activities in nature. 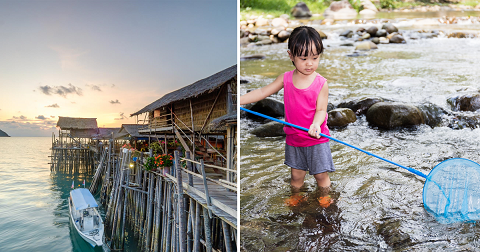 A sleepy fishing village in Johor, Kukup features affordable chalet-style accommodation on stilts over water. From karaoke facilities, kelong tours to shopping for local produce (the sellers come straight to your doorstep!) in a spacious space where kids can run wild, a weekend retreat in the backwaters of Johor promises the perfect family bonding session. Did we mention that meals are fully provided? Dining in an open-air restaurant built on stilts above water will be a refreshing experience for the kids. Your kids can also learn about fish-farming by visiting one of the many kelongs or embark on a mangrove tour. Approximately 3 hours ride from Singapore, Kluang is that understated town in central Johor that has much to offer beyond cheap, good food! Ideal for fun and educational trips, Kluang is easily accessible by self-drive, buses and rail! Slow your pace while you are in the countryside, and learn together with your tots. There are a number of family-oriented farms that offer accommodations and learning activities, making them convenient, self-contained destinations. For instance, visit the UK Agro Resort which boasts Malaysia’s largest goat and sheep farm and offers fun activities such as animal feeding and sheep catching. Less than four hours’ drive from Singapore, Pork Dickson promises a relaxing weekend getaway that is ideal for the family. 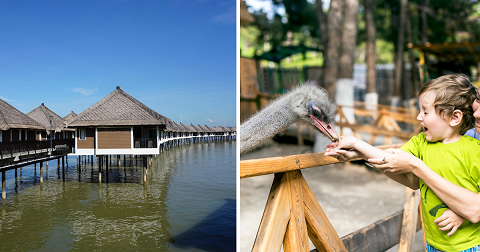 Imagine unwinding to the sounds of gentle waves in your water chalet at the Avillion spa resort, which conveniently includes kid-friendly facilities such as Kids’ Cabin, Pool and Spa, an aviary, and even a pet farm to keep your young ones entertained! If the aviary isn’t enough for your kids, you can also bring them to the PD Ostrich Farm to learn more about these giant but gentle birds. For boys and girls interested in things military, there is the Port Dickson Army Museum, which is open daily with allows free admission. Return transfers can also be easily arranged for those who do not wish to self-drive. Travelling by land has its perks, especially if you are doing a road trip. Driving to your intended destination gives you the flexibility to stop whenever you wish to – an important factor when travelling with young children! Before embarking on your journey, do make sure that your car insurance’s coverage includes the destination you are headed for, and provides comprehensive coverage rather than just third party protection. If you are planning a road trip in our neighbouring country, note that most motor insurance in Singapore cover West Malaysia, but it is well worth to check your policy document if you’re unsure. Less than 2.5 hours from Singapore lies the bustling city of Yogjakarta, which is renowned for being a centre of education, Javanese arts and culture. This major Indonesian tourist hub is fast gaining global popularity with its natural waterfalls and caves! For families with older kids, cave tubing at various venues such as the Pindul Cave or Jomblang Cave offers a mystical adventure. Being in such natural lazy pools promises family fun and bonding that you’d not be able to get at home. 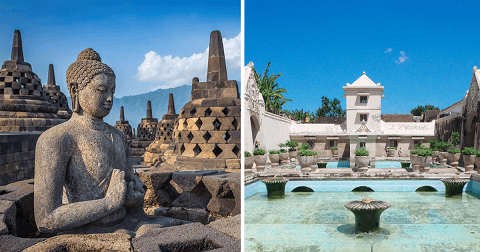 Kids can also cultivate their appreciation of history by visiting the Borobudur and Prambanan temples, both of which are UNESCO heritage sites, or just have fun visiting the Lost World Castle. For families with younger children, there are luxurious hotels (check out the Phoenix Hotel by Sofitel!) that makes for a relaxing staycation with affordable, flavourful food. 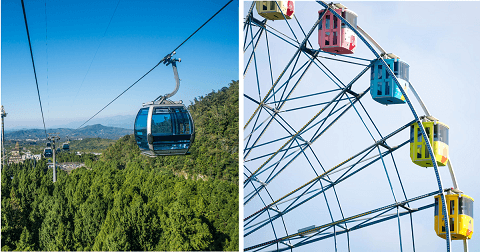 Hong Kong – Alternative fun rides outside of theme parks! A short flight of 4 hours away, Hong Kong is that popular family-friendly destination with theme parks such as Disneyland and Ocean Park for fun and educational trips with older children. However, expensive attraction tickets and long queues may test patience, hence proper planning must be in place to ensure travel joy for both adults and kids. 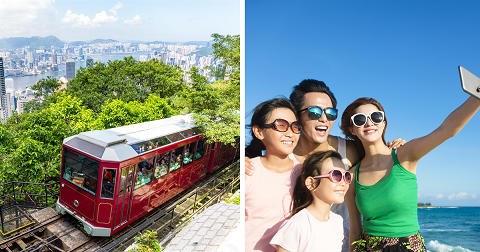 Consider visiting theme parks on week days, and engage your children in alternative fun rides such as taking the Star Ferry to Kowloon Island or the Peak Tram, which trudges on Asia’s oldest funicular railway! Would your kids prefer to stay in a Lego block castle-themed room or a safari-themed where animals roam free? At the Sato Castle Motel and Leofoo Resort respectively, your accommodation alone seems like a fun destination for the old and young, and there are plenty more of such in Taiwan! 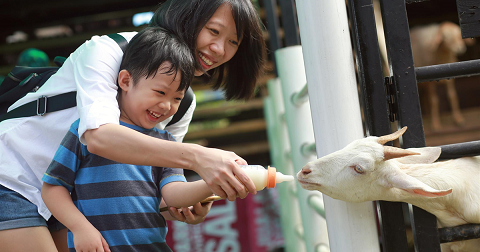 If learning about agriculture is more your thing, there are many farm stays to choose from Word has it that the Taipei Zoo – largest in Asia – is a must for animal lovers. While you are around the area, don’t miss the Maokong gondola and the Maokong village for tea with a great view! Known for its good food, nature and theme parks, Taiwan – a mere 4.5-hour flight away – is that fun destination worth a repeat visit over and over again! The above recommended destinations are less than 5 hours by flight from Singapore, and budget airlines sometimes offer very attractive promotion prices. However, it is important to do due diligence when travelling with kids. Don’t forget your travel insurance – a family purchase will be more value-for-money and be sure to check out travel delay benefits in case of unexpected flight delays. Did you know that Etiqa Insurance is the only insurer in Singapore to offer an automated, straight-through process for flight delay monitoring, notification and travel claims? In the event that your flight is delayed for 3 hours or more, you will get notified and your claims will be automatically processed. 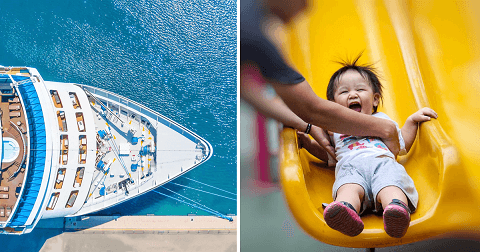 Cruises are not “destinations” per se of course, but they can be wonderful short getaways (around 3 nights could be ideal) if your child is younger. There are numerous international cruises departing from Singapore such as Mariner of the Seas from Royal Caribbean Cruises Ltd and Sapphire Princess from Princess Cruises. These all-inclusive cruises is your floating integrated resort with entertainment and dining facilities that keep you and your family engaged in between shore excursions in Asia or even further (if time permits!). The best part? Parents can really relax while your children have fun partaking in youth activities and programme under the supervision of professional staff. Some of the cruise ships even offer a toddlers’ play area, splash pool, computers, and video games! Get a room with a balcony, and your toddler may well spend much of the day there gazing out into the sea in wonderment and pointing out passing ships with glee. If your child is fidgety and doesn’t like to sit still for long, destinations that require less travel time may be more suitable. Alternatively, you can plan your journey such that there are stops along the way during which your child can move around and explore the surroundings. Instead of distracting your kids with mobile devices, a book or puppet will be good for spending quality time together. What is your child’s temperament and interests? A quiet, introverted child might be happy spending time with you in laid-back locations such as beach resorts. Others might prefer the fun and excitement of theme parks. Are the elderly in the family joining the trip? It can be stressful for the planner to take into considerations what everyone might like, hence priorities must be set. Remember, you cannot please everyone. Your child may require lots for stuff for the day, depending on his age – diapers, bottles, water, milk powder, snacks, creams and lotions, and even a pram. You may hence prefer places whereby bringing all these out on a day trip is not too onerous. Whichever destination you choose, make it a memorable trip for the little one. We wish you a safe and enjoyable family vacation! Committed to placing people over policies, Etiqa is a Singapore insurance company owned by Maybank Ageas Holdings. Maybank Ageas is a joint venture between Maybank Group–the fourth largest Banking group in Southeast Asia with more than 22 million customers across 20 countries worldwide, and Ageas –one of Europe’s largest insurance companies with 33 million customers across 16 countries and a history of over 180 years. Protecting more than 300,000 homes in Singapore since 1961, Etiqa is best known as the appointed insurer for the Singapore Housing Development Board (HDB) Fire Insurance Scheme. Etiqa also provides comprehensive life and general insurance solutions with affordable and transparent insurance premiums. These include motor insurance (including motorcycle insurance), travel insurance, home insurance, maid insurance, , insurance savings plan, retirement and . Etiqa is one of the first insurance companies in Singapore to empower its customers with online insurance, offering innovative, customer-centric experience such as real-time travel delay insurance and usage-based car insurance.